For my first blog post, I'd like to talk about one of the latest trending fashion fabrics, Neoprene. I love the stuff! So much so I've dubbed myself the Neoprene Kween. My fascination started off at a slow and curious pace about a year ago and has grown into an uncontrollable addiction. This morning I bought 35 metres! It was necessary, I assure you. Neoprene (polychloroprene), was invented by Wallace Carothers at DuPont in 1931 and was patented as Duprene. It is a synthetic rubber and was the first polyester super polymer to be invented. Nylon followed not long after in 1935. DuPont later received the USA National Medal of Technology for the development of neoprene, nylon and teflon. Neoprene in its base form, is far more rigid than the wetsuit fabric that commonly comes to mind when people hear the word neoprene. It is a sturdy rubber and due to its array of functional properties, such as liquid, heat and weather resistance, has many industrial applications in the construction, electrical and automotive industries. When speaking in apparel terms, neoprene in its ‘solid form’, was traditionally a wetsuit fabric, it feels soft and spongey to the touch. The core is a foam and it is sandwiched between two layers of knit fabric, generally polyester. This is a more common type of neoprene than its sportier mesh form and is what scuba knit fabric is modelled off. Scuba knit is sometimes mislabelled as neoprene in fashion marketing. This type of wetsuit neoprene comes in a variety of thicknesses and colours. The best stockist of neoprene that I know in Melbourne is Darn Cheap Fabrics. They have three stores, City, Glenhuntly and Heidelberg. If any readers know of other good stockists in Melbourne, then we’d love to hear from you, pop a comment down below. Neoprene has risen in popularity amongst fashion designers over the last ten years as we’ve looked for ways to innovate new silhouettes and textures. It is an ideal textile due to its highly sculptural and buoyant qualities. Its tendency to roll in a smooth curve rather than fold or fall flat gives it an almost gravity defying nature. In some designs it can completely remove the need for under-structures and interlining. Scuba is a double layer knit fabric made of filament fibres and does not have a foam core. Scuba is primarily used for swimwear, bodycon garments and apparel seeking a sporty appearance. Currently I do not use any scuba knits in my apparel design and have no current plans to do so. I don’t find it interesting enough, to me there is nothing special about it. It’s just a slinky polyester knit. It also hangs heavy and I like a lighter sport knit if that’s what I’m after. In its mesh alternative, which is less common and far more exciting, the foam core is knitted into each of the polyester layers on either side. It has a honeycomb patterned structure with a slightly offset appearance between the two outer layers. This fabric is more commonly used by designers and dressmakers to add volume to skirts, such as tulle does, rather than as an outer or main fabric itself. I favour working with the mesh neoprene, less so because of any functional aspect but because of its aesthetics. I love the offset honeycomb pattern, it creates an optical illusion effect. It is a bit like a fractal, the eye has trouble focusing on the lines and is challenged to decipher what it is looking at. This textural effect creates depth and intrigue. I’ve been working with a couple of different types of mesh neoprene. One that is a very fine honeycomb, the holes are 1.5mm wide and 4mm high. The other is a much larger scale with holes measuring 4mm wide and 7mm high. The finer variation has more of the optical illusion effect and in my opinion, has a much chicer look to it. I view it as an evening street/sport style. Currently I’m making an oversized bomber jacket with a pink body and white arms. The whole jacket has a second layer made from clear PVC and is lined in blue that shows nicely through the neoprene mesh. A glorified raincoat if you will. She’s a real character, thinking of calling her Nightmare on Sesame Street. Sewing the solid wetsuit style neoprene is pretty straight forward so I’m going to focus on talking through the mesh type, which is a bit more challenging. On one hand I’d say it’s harder than sewing with a silk chiffon but on the other hand I’d say its easier. All in all, it’s an advanced level fabric to work with. The most notable characteristic with the mesh is the way it drifts under the machine foot. Because of its structure the layers compress at an offset. The top layer pushes down and away ever so slightly as it hits the bottom layer, which then also pushes away. Because of this it is hard to get the two layers to sew flat together. Whereas the wetsuit style compresses straight down and then moves under the foot. The counter balance to this drift with the mesh would usually be to take a firmer, yet delicate, grip on the fabric and a more controlled guide style as it is pulled through the footplate by the feed dogs. This works well on other fabrics that tend to drift, even a silk will respond well to a skilled heavy-handed approach when dealing with drift. The issue with the mesh is that you can end up distorting the honeycomb pattern and the fabric will not sit right. The best advice I can give is to half let the mesh tell you what it wants to do and half firmly tell it what to do. I realise that is very non-technical advice but as you sew with it you will feel what I am talking about. One of the wonderful things about neoprene is that it doesn’t fray when it’s cut. Now I’m firmly NOT a part of the REC (raw edge club) BUT it actually looks fine, I’d go so far as to say it looks good and I like it. I would usually leave it raw on a hem so as to not create any bulk and effect the way it looks and sits. 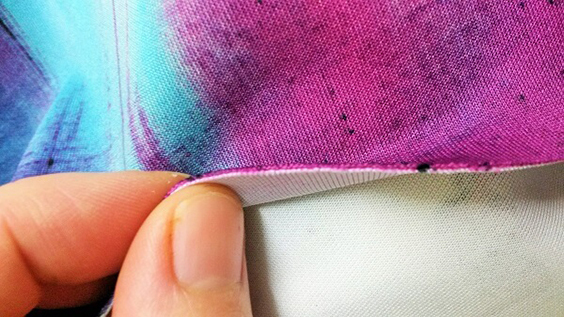 However, for seams I usually French seam (only everything always! #jokes #nojoke). An alternative is to bind them or even just leave them raw and top stitch each side of the seam down. It really depends on the garment and seam location. I sew with an old Juki automatic industrial plainsewer. It’s about thirty years old and still going strong. I’m a staunch advocate for industrial machines. I can see the relevance for domestic machines for many sewers but personally they just do not cut it for me. I ask a lot from a machine in terms of strength and plastic parts are not an option. In regard to sewing with neoprene, I would recommend an industrial machine, that’s not to say that a domestic won’t do the job but it’ll move through the foot much easier and nicer and you’ll have more capacity to focus on working with the fabric, rather than is she going to blow matey. Well thanks for reading. I’d love to hear from other designers and dressmakers about what work they are doing with neoprene, it’s always exciting to talk with my fellow Neoprene Kweens. Feel free to ask me any specific questions that may help you with your neoprene projects via the comments section.